Blog Wondershare PDF Editor - The most powerful PDF Editor launching soon. Wondershare PDF Editor – The most powerful PDF Editor launching soon. Hello folks, Ever been so worried about editing a PDF file for extracting some contents for your project? Dont want to shell out huge money for a professional PDF Editor software? Wondershare PDF Editor is the perfect solution to your needs. The best thing about this software is its simplicity yet powerful performance. I recently got one PHP project and was struggling for a powerful PDF editor for the purpose and it was my colleague who suggested me Wondershare PDF Editor. The easy to use interface and powerful integration of various features, helped me complete my project without any hassle. The Editor also provides a feature to convert the PDF file into Word document without loosing any layout, formatting and elements. It can also convert encrypted PDF files to Word document. There is also a provision to convert selected pages of your PDF file to Word. The additional features include “Find and Replace”, “Annotation History”, “Add Bookmark”, “Multilingual Support – with 17 language support” and more. The Software is in beta stage and the final version will be released on 15th June 2012. Viewers can download the current beta version from the official website of wondershare. Moreover, the beta version will have 100 days validity with full features. The beta users then can acquire a full lifetime licence for the upcoming paid version with 50% discount. 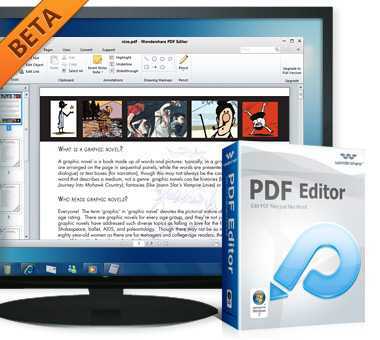 The PDF Editor is tagged with price $59.95 for lifetime licence with product support and updates. Wondershare as part of their ongoing activity at the studio website is offering Free full licence giveaway for its beta users who suggest 3 or more valuable feedback on the product. To participate on the free licence giveaway activity, visit HERE. The activity period is from April. 5th 2012, 00:00 PST – April. 30th 2012, 24:00 PST. So, grab this opportunity and get the most powerful PDF Editor for your work.